Crispy fried chicken is one of life’s greatest pleasures. It should come as no surprise that Nebraska is teeming with exceptional fried chicken options, as a state steeped in agricultural history. So roll up your sleeves, grab some napkins, and head to one of these 10 best fried chicken joints in Nebraska. If you’re looking for some amazing fried chicken, add Block 16 as a destination. This popular lunch spot serves fresh and flavorful fried chicken with gourmet French fries and plenty of sauces for dipping. Lee’s Chicken is the oldest operating restaurant in the city of Lincoln and has been serving chicken and fixings in a fun, family-friendly atmosphere since 1945. 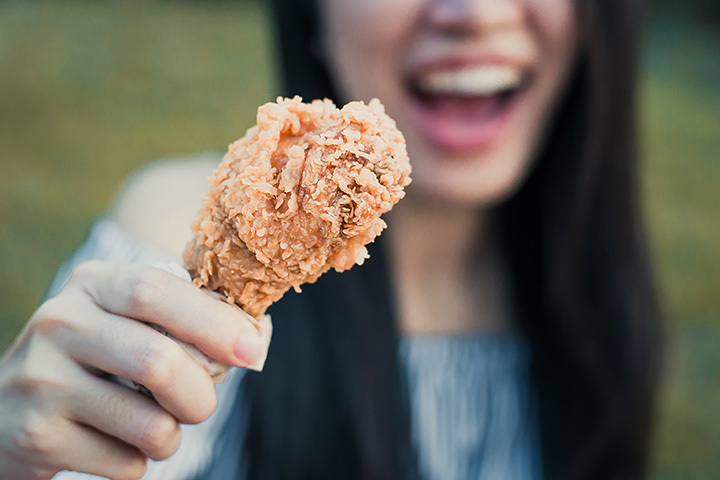 Every piece of chicken at Lee’s Chicken is expertly seasoned and fried to perfection. For Southern-style fried chicken, Lolo’s Chicken & Waffles in Omaha is the perfect choice. Every piece of chicken is covered in tasty seasoning and comes with your choice of a corn muffin, greens, or other grilled vegetables. The highlight of the menu at Boss’ Pizza & Chicken in Lincoln is definitely anything related to the chicken. While the chicken is technically broasted, instead of fried, this method ensures every piece is extra crispy on the outside and extra juicy on the inside. Nebraska may be in the Midwest, but that doesn’t mean you can’t find delicious soul food here. At Quick Bites Soul Food in Bellevue, the fried chicken arrives at your table piping hot and full of flavor. With tasty sides like green beans, okra, cornbread, and collard greens, Quick Bites Soul Food is a timeless Southern classic. If you’re looking for family-style, pan fried chicken, then make your way to Sozo American Cuisine in Kearney. Everything on the menu comes from local producers so you know it’s fresh. For home-style fried chicken dishes, make your way to Big Mama’s Kitchen in Omaha. This warm, inviting restaurant serves all of the classics—including chicken and waffles, with tasty sides like cornbread, mashed potatoes, or mac and cheese. Get here early for some of the best fried chicken in the state. Slim Chickens in Lincoln is famous for its fulfilling fried chicken and waffles and handmade dipping sauces that will keep you coming back for more. A meal at Slim Chickens is also never complete without trying one of their delicious desserts served in a Mason jar. From fried chicken and waffles to Sriracha fried chicken wings, Blatt Beer & Table is the only place to go in Omaha when you’re craving juicy and crispy chicken to go along with one of the 20-plus beers on tap. Mary’s Cafe is a hidden treasure in Nebraska City that offers plenty of fried chicken options with tasty sides. Be sure to visit this no-frills cafe on Sundays when they’re serving their exceptional fried chicken dinners that are always worth the wait.